Flag march in Itanagar covered areas between Bank Tinali to Ganga including critical polling stations (e.g Commissioner Tax and excise, Donyi Polo Vidhya Bhavan school building, EE (PWD) Div -III, Govt M. E school D sect.) where there is history of poll violence and booth capturing. Similarly, critical & vulnerable polling stations in Naharlagun areas viz Kankarnallah GHSS, Director of social welfare old Secretariat, Director of art and culture East and west, SE power office building east and west, Govt ME school G sector east and west, Dy Chief wildlife warden office building east and west, Govt HSS Polo colony east and west, Govt ME school D sector (2 PS), Govt middle school Barapani (2ps), Central School C sector east and west, SE PWD office building Pappu Hill east and west, Govt primary school Pappuh village and Govt secondary school pachin colony, A total 22 polling stations were covered. 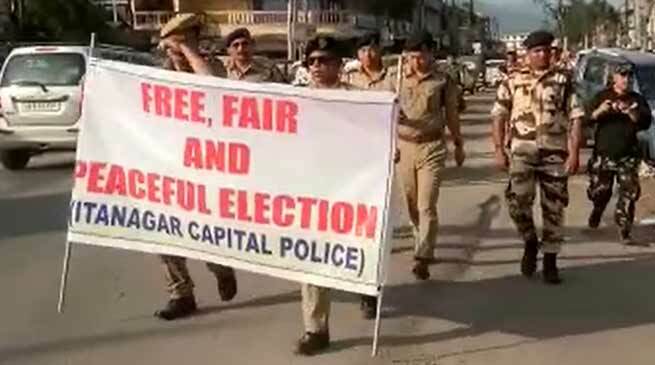 The security forces escorted by SDPO and other police officers walked through the National Highway for confidence building measures that the election should be in free and fair manner and all should come forward to cast their valuable vote without fear. Itanagar SDPO Dekio Gumja said.